Each fall I plant a row of tulips in my vegetable garden, where they will be protected from admiring deer who think they are delicious. 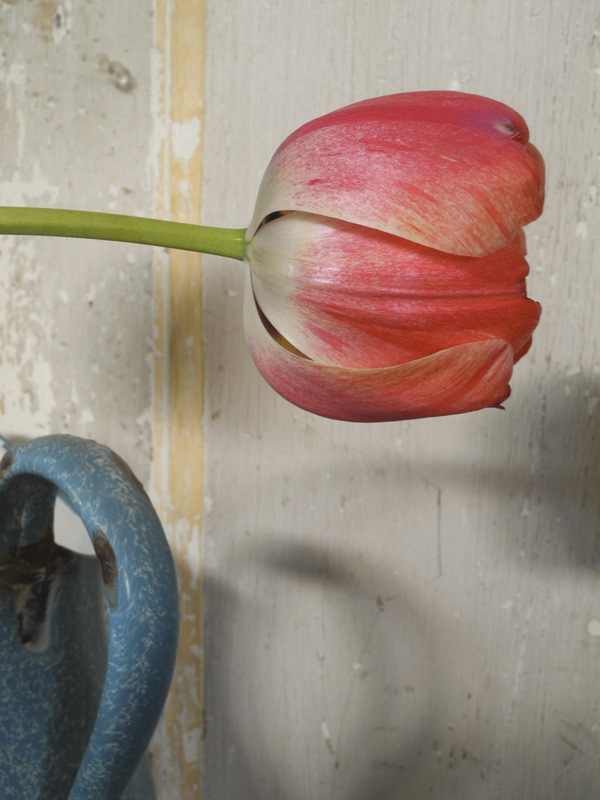 Each spring I have vases and pitchers of tulips gracing the house, where I can admire their form and watch them change over time until they drop their petals. And each spring since 2010 I have photographed the tulips and shared them in a blog post: here are links to the posts from 2010, 2011, 2012, 2013, and 2014. 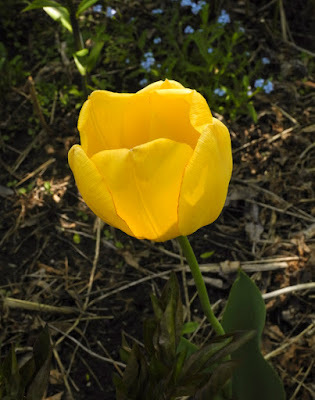 The unnamed tulip above (I often get incorrectly labeled bulbs) has a classic tulip shape, with rounded petals forming a perfect cup. 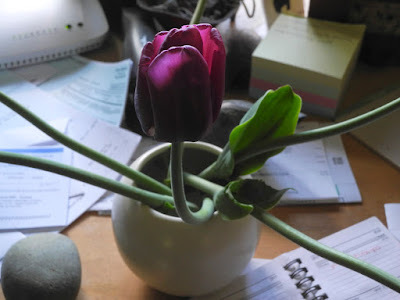 The tulip is such an elegant flower that it brings order to my messy desk. I was drawn to photograph single flowers this year, so as to highlight their color and shape. This tulip, which came in the same bag as the first one, is clearly not the same variety. It has the same perfect shape, but its petals are lightly flecked with pale yellow, and its base is white, not green. 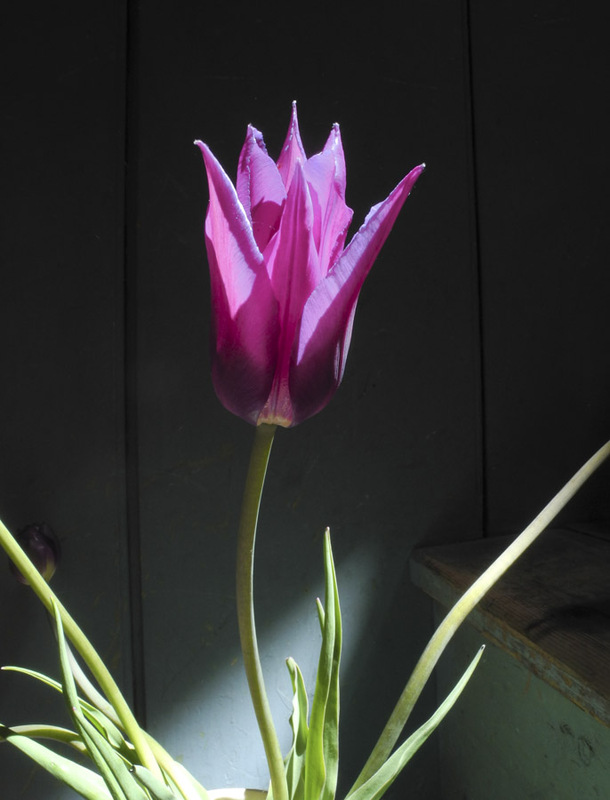 This dark red tulip has dramatic darker purplish flames rising up on its slightly fringed petals. ....and when fully expanded, and looking like their namesake lilies. This variety is named Purple Dream. The varied colors and irregular form of the spectacular parrot tulips––this one is Rococo––remind me of the story of Tulip mania that took hold in the Netherlands in the 17th century, when a single bulb may have fetched an enormously high price. The Wikipedia article at the link explains that this may have been something of a myth. 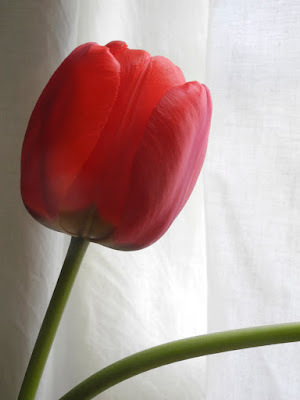 Nonetheless, tulips had recently been introduced to Europe from Turkey, and their value as beautiful flowers was clearly understood. 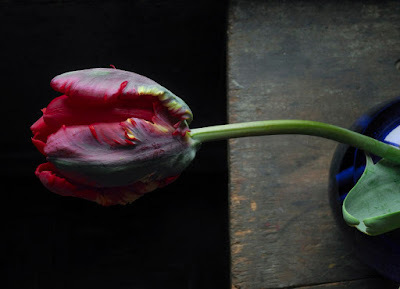 Even as it moves toward the end of its life, the Rococo tulip has a dramatic presence. 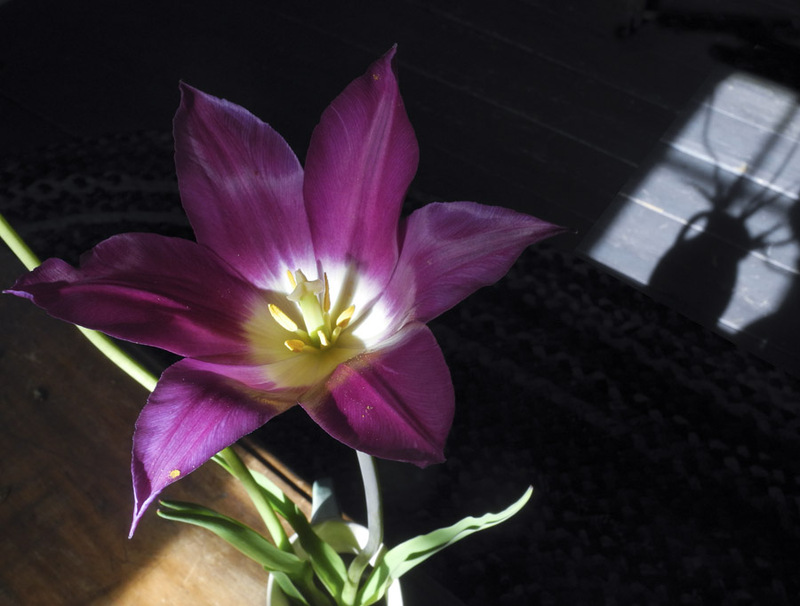 This is a truly gorgeous tulip that I haven't grown before, the viridiflora tulip Esperanto. Viridiflora is from the Latin viridis, "fresh green", as the center of the petals have a green flame. 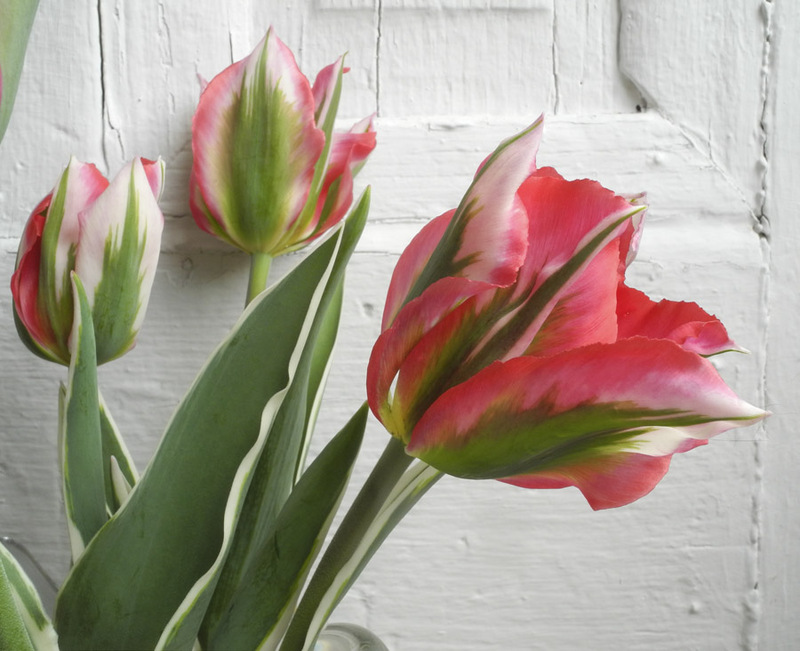 In this tulip the green is bordered by white and pinks, and it's such a pleasure to see the variations in color and the changes in shape as the pointed, wavy petals open. 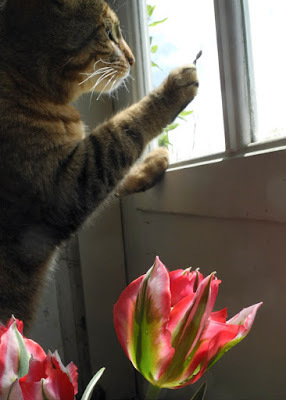 As I was photographing Esperanto, Poppy got into a picture; she was interested in the insects mating on the windowpane outside. 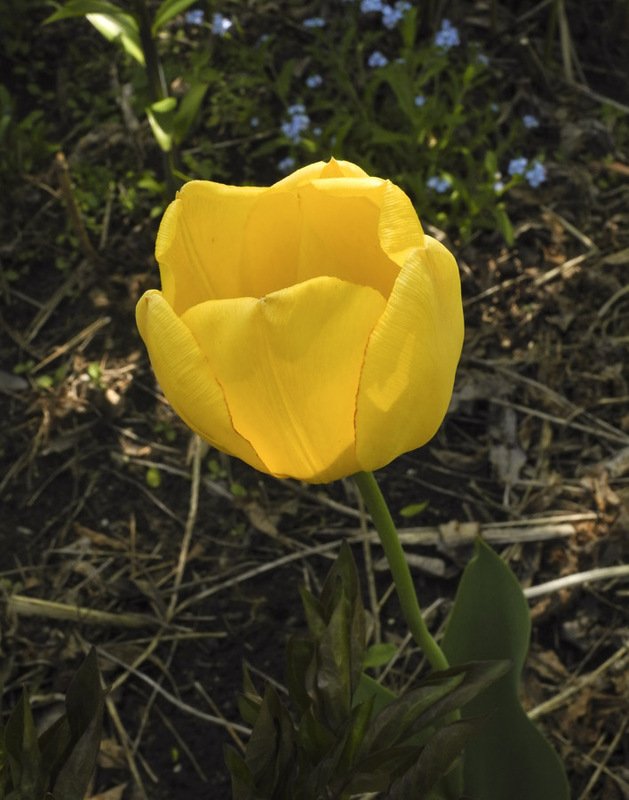 Lastly, a yellow tulip, blooming outdoors in the peony border. Many years ago I planted several Emperor tulips there, and from time to time one or two will bloom. After all the red tulips––for some reason I didn't realize all the tulips I had ordered were in the red family––it is a treat to see a yellow one; it can fit into the red theme because of the very thin red border along its petals. 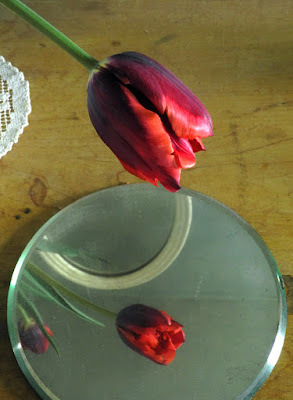 The photographs keep the tulips present; in the garden they have given way to lilacs, which in turn will give way to other flowers during this grand season of spring. The tulip! 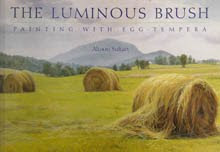 Worth a paean, and maybe a craze, and really fun to draw -- nothing like them for color and form in all stages. 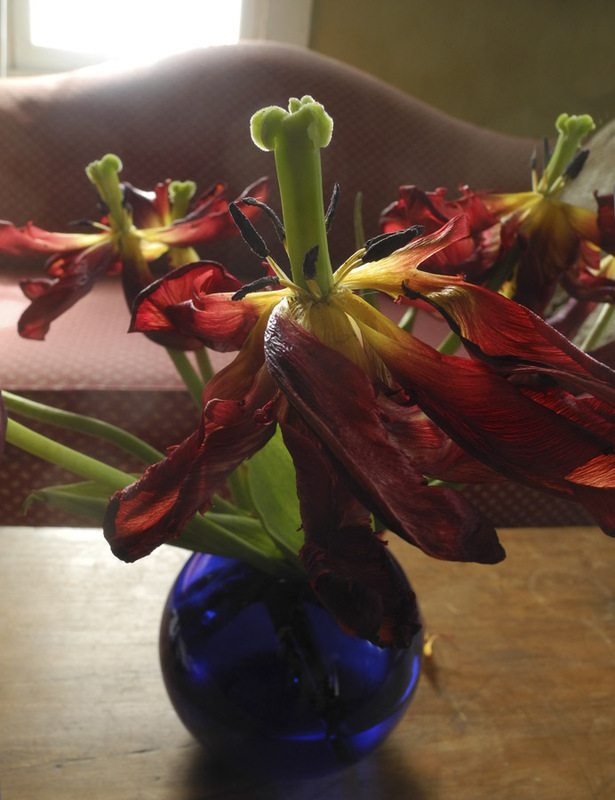 I'm starting to even like the parrot tulips, which are so extravagant and strange. Thank you for the images and thoughts! Beautiful. Even the red-and-purple Narcissist! Tulips seem to scream spring to me. I love all the colors and forms. "SPRING!" they scream as I tiptoe too close, which, after my bleeding-heart regains something closer to normal cadence, I consider concise of them, for they might have screamed, "STEP BACK!" or "BACK OFF" or even "FALL!"! Thanks for looking, and thanks for the comments. Stunning, bold plants, but I especially find your photographs exquisite. I am trying to figure out the connections and differences when you workin various media. Thanks, Julie. A lot of the time I too am trying to figure out the connections with my various art projects. 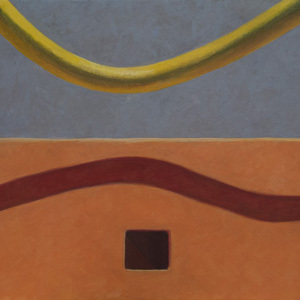 A New Textile: "Deep Pink Flow"
A New Painting: "Large Curve"